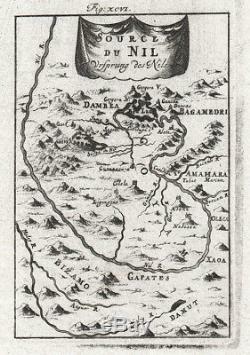 1719 Mallet Map of the Source of the Nile, Ethiopia (Abyssinia). WE SELL ONLY ORIGINAL ANTIQUE MAPS - NOT REPRODUCTIONS JOIN OUR WEEKLY MAILING LIST FOR NEWEST STOCK. Description: From his two springs, in Gojam's sunny realm, Pure welling out, he [the Nile] through the lucid lake Of fair Dambea rolls his infant stream. -Thomson, James:'The Seasons: Summer,' 805âÃÃ¬8 A stunning and surprisingly accurate 1719 Map of the Source of the Nile by Alain Manesson Mallet. Details what is today the Gojjam (Goyam on map) district of Ethiopia around Lake Tana (here Bed Lac or Dambea). Accurately describes the course of the Blue Nile as it flows southward from the southeastern corner of Lake Tana before hooking around to the west and flowing northwards toward its convergence with the White Nile and, ultimately, the Mediterranean. Names numerous villages and Ethiopian Orthodox monasteries throughout. Shows mountains in profile, however, as this is not a particularly mountainous region, we can assume that Mallet must have added these merely as decorative place holders. Mallet no doubt drew this map based on the accounts of early missionaries who were active in the area throughout the late 17th century. Prepared as figure XCVI for the 1719 edition of A. Mallet's seminal Description de l' Univers which was, itself, the largest and most comprehensive work of its kind issued to date. Size: Printed area measures 7 inches high by 4.5 inches wide. If your address is a P. DHL International EXPRESS (45 USD). We can use your Federal Express Account. Duty varies by country and we cannot predict the amount you will be charged. Some countries are duty free, others are not. Additional Services Conservation Framing Services: Geographicus recommends basic conservation framing services for any antique paper. We do not offer this service. Antique Map Restoration Services: Geographicus can repair and restore your antique map. Services include deacidification cleaning flattening and backing. The item "1719 Mallet Map of the Source of the Nile, Ethiopia (Abyssinia)" is in sale since Monday, October 22, 2018.